Martha Ann Roper Sumner, 81, went into the arms of our Lord and rejoined her best friend and husband Patrick, the evening of November 27, 2018. She passed quietly at home with her hospice nurse and family at her bedside. Public Visitation: 6 p.m. to 8 p.m., Tuesday, December 4, 2018 at Bean-Massey-Burge Funeral Home. Funeral: 10:30 a.m., Wednesday, December 5, 2018, at First Baptist Church in Grand Prairie. Interment: Grand Prairie Memorial Gardens. Martha was born November 14, 1937, to J.O. and Florine Roper in a two room house in Eatonton, Georgia. She grew up in a loving Christian home that would mold her into the extraordinary woman she would become. Martha was a strong, independent woman with a kind heart and servant's spirit. She loved people and serving others. Martha chose to become a registered nurse to serve those most in need for many years in her home state of Georgia. 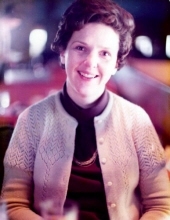 She served as a nursing administrator, worked in geriatrics and critical care. She trained new nurses and volunteers, delivered many babies; but, her passion was always pediatrics. She loved children. As the years passed, Martha became restless to see the world. She joined the Air Force as a lieutenant and was promoted to Major. She traveled extensively in the Middle East and Southeast Asia while passing through various points in Europe before returning home. Her favorite deployment with the most lasting impact was the two years she served as a private duty nurse in Tehran, Iran. There she met Patrick Sumner in a small home church during Bible study. They stayed in contact after they had both returned to the United States and the relationship blossomed. After two decades, Martha retired her nursing cap to take on a new role as a loving and devoted wife and mother to their soon to come two children, Christina and Catherine. Their 40 year marriage began August 17, 1975. They made Grand Prairie, Texas, their forever home in 1976. Martha was especially active in her final church, First Baptist Church of Grand Prairie. She found great joy teaching children's Sunday School alongside her husband for many years. Martha went back to work part time when her children were old enough to enter school. She began what would become a 30 year career and personal ministry at First Baptist Church, managing and cooking in the kitchen that would serve meals to hundreds of thousands of people. She touched many people from all walks of life. Martha loved to travel, cookbooks, crafts, sewing and playing the piano. In her final years, she found great happiness in her last role as a grandmother to Ella and Noemie. She is survived by her eldest daughter Christina Sumner Farah, her spouse Ramzi Farah, Catherine Sumner, her youngest daughter, two grandchildren, Ella Smith and Noemie Farah, brother, Melvin Roper, along with his spouse, Pasty Roper of Cedartown, nephews, Scott and Andrew Roper of Cedartown also survive. The following gentlemen will serve as pallbearers: Ramzi Farah, Melvin Roper, Scott Roper, Andrew Roper, Jack Roper, Greg Froman, William Brentlinger and Al Reeves. The Smith and Miller Funeral Home of Cedartown is honored to make this local announcement for the family of Mrs. Martha Ann Sumner. To send flowers or a remembrance gift to the family of Martha Ann Sumner, please visit our Tribute Store. "Email Address" would like to share the life celebration of Martha Ann Sumner. Click on the "link" to go to share a favorite memory or leave a condolence message for the family.